Did you know that chard aids digestion? That parsley fights aging? If you’re not eating (or drinking) your greens, here’s what your body could be missing. From the 10-Day Green Smoothie Cleanse. • Arugula: Arugula is a great source of folic acid as well as vitamins A, C, and K, and provides a boost for bone and brain health. It has a zippy, peppery flavor. • Beet Greens: Beet greens are the leafy tops to the beet vegetable. They are rich in vitamin K. They are known to help improve vision, help prevent Alzheimer’s, and boost the immune system. • Bok Choy: Bok choy is a Chinese cabbage that is mild tasting and crunchy. It is full of vitamins A, C, and calcium, as well as antioxidants. • Chard (aka Swiss Chard): Chard is a green leafy vegetable that displays red stalks, leaf veins, and stems. It has a beet-like taste and a mild texture. It is known to help prevent cancers and is good for cleansing the digestive system. • Collard Greens: Collards are green leafy vegetables that are nutritionally similar to kale but chewier and with a much stronger taste. They are a superior agent for binding to bile acids throughout the digestive tract, which makes them very good at lowering cholesterol. • Dandelion Greens: Dandelion greens look like weeds in your lawn, but they are yet another great source of vitamins A and K. They help the digestion process and can help constipation issues because they are a natural laxative. • Kale: Kale is lightweight with ruffled leaf edges. It is loaded with vitamins A, C, K, and more. It is known for lowering the risks associated with developing prostate, ovary, breast, colon, and bladder cancers. • Lettuce: Lettuce has been a popular staple in salads since the time of the Ancient Egyptians. It contains essential amino acids and vitamins. Be sure to eat lettuces with dark green leaves to get the highest nutritional value. Romaine lettuce, in particular, has high levels of vitamin C, K, and A and is a good source of folic acid. • Mustard Greens: Spicy mustard greens are effective in lowering cholesterol and provide a healthy dose of riboflavin, niacin, magnesium, and iron. They are a storehouse of phytonutrients that have many disease-preventing properties. • Parsley: Parsley is rich in antioxidants, minerals, vitamins, and fiber and is known to help reduce aging and regulate blood sugar levels. • Spinach: Perhaps the most beloved green leafy vegetable of them all, spinach is mild tasting and not as bitter as other greens. Its dark green leaves really pack a punch with high levels of omega-3s, calcium, magnesium, and vitamins A, C, E, and K. When most people start drinking green smoothies, they start with spinach! • Turnip Greens: Turnip greens, although slightly bitter, are very flavorful. Turnip greens are effective at providing many numerous health benefits, but they stand out amongst other green leafy veggies in their ability to fight the development of cancerous cells. 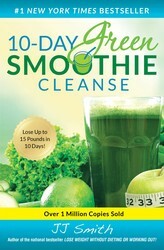 The New York Times bestselling 10-Day Green Smoothie Cleanse will jump-start your weight loss, increase your energy level, clear your mind, and improve your overall health. Made up of supernutrients from leafy greens and fruits, green smoothies are filling and healthy and you will enjoy drinking them. JJ Smith is the author of the #1 national bestseller and USA TODAY bestseller Lose Weight Without Dieting or Working Out! JJ Smith is a nutritionist and certified weight-loss expert who has been featured on The Steve Harvey Show, The Montel Williams Show, and The Jamie Foxx Show and on the NBC, FOX, and CW Network television stations, as well as in the pages of Glamour, Essence, and Ladies Home Journal. To learn more, check out JJSmithOnline.com. Share Are You Eating the Very Best Supergreens for Your Body?